Female bloggers in Cambodia are often affectionately referred to as “Cloghers,” however, blogging still remains an activity primarily for urban residents and those with better access to these technology resources. The Cambodian Center of Human Rights sees the opportunity to support new Cloghers from rural communities that are now studying in Phnom Penh, who have a unique perspective as bridges between their home rural communities and the bustling capital city. Through blogging workshops, the new Cloghers are sharing personal stories and insights regarding the human rights situation across the country, while building important networks with other female students that share a similar background. Recognition of project participants with Sopheap Chak, CCHR Executive Director. Photo by CCHR. 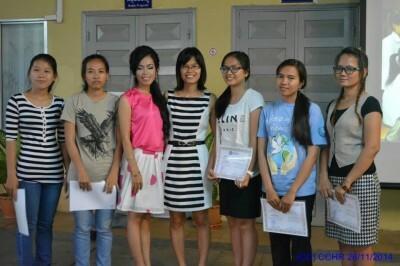 Over the course of a six-month project, approximately 12 cloghers completed the blogging trainings, which included adding new skills how to create and maintain their own personal blog, as well as writing tips for telling the story of rural Cambodia. Through a blogging competition, three cloghers were chosen for their blog posts. At a ceremony in November 2014, the three winners and all participants were recognized at Clogher Corner. While the first phase has concluded, the CCHR hopes to launch more opportunities to train new cloghers in the future.